"Le Ginestre": the better geographic position to visit the Tuscany. We invite you to spend your holidays in the heart of Tuscany, in the middle of Val d'Elsa, in the village of Badia a Cerreto, at 5 minutes from Certaldo and 15 from San Gimignano, surrounded by wonderful country of Tuscany and surrounded by the most beautifull cities of art like Florence, Siena, Lucca, Pisa, Volterra and others, in a flat with indipendent entrance, elegantly furnished and with a lot of confort, right for a holidays of culture or relax. "Although small, the apartment is clean and well-presented. The village itself is small and quiet, and a car is really necessary for travelling around, sightseeing and going out to eat! There are two restaurants within walking distance. The family were very helpful, and recommended places for us to visit. 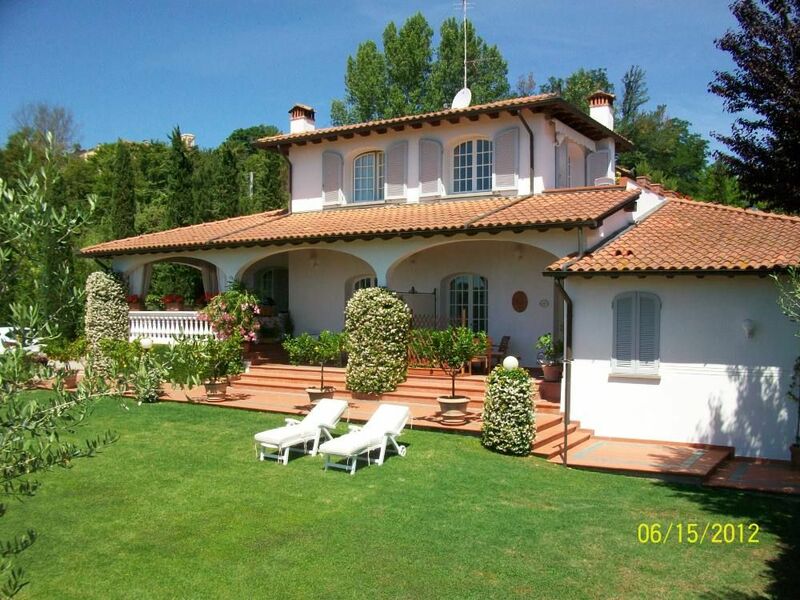 The villa is situated on a hillside and has wonderful views. There is a little noise from the rest of the building, as this is a ground-floor garden flat. I would recommend this to anyone who wants to experience Tuscany, but you must be prepared to travel to be able to visit Florence, Siena and Pisa." Immaculate accommodation and hosts were extremely friendly, hospitable and helpful. In quiet situation 2km outside Certaldo. The apartment's terrace does not have a view unfortunately, but there is a communal area in the garden which can be used. Wonderful home, beautifully appointed. Lovely outlook over hills and Certaldo. Friendly hostess and beautiful garden. WE loved it. Accueil chaleureux de Maria-Louisa et Jospeh, toujours disponibles en cas de besoin et bon conseilleurs pour découvrir la région. La location est conforme aux photos. C'est propre et élégamment décoré. Sa situation géographique est très bien pour aller visiter Pise, Florence, San Giminiano, Sienne etc ... La piscine est la bienvenue après une journée de balade dans cette belle Toscane. Abbiamo passato un breve ma piacevole soggiorno in un appartamento soleggiato e perfetto per due persone. Il nostro cane poi ha adorato correre nel prato antistante l'appartamento, perfetto per rilassarsi al sole, anche quello invernale. Avremmo preferito una doccia più funzionale rispetto alla vasca un po retrò e un materasso più morbido, ma nel complesso ci siamo sentiti come a casa. the church you have to turn on the left, you are arrived at Villa le Ginestre. (Text automatically translated) The main tourist attractions are within easy reach either by car or train from the station Certaldo.Nelle these locations you are interested in monuments and works of art typical and regional cuisine.